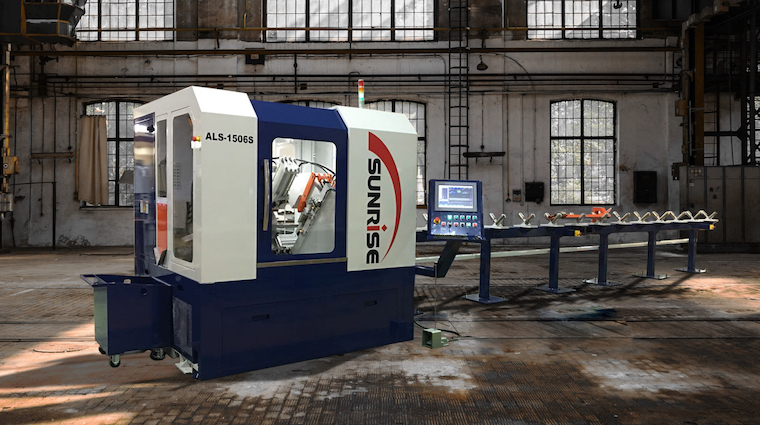 The SUNRISE ALS is a fully automatic angle processing system with the option to process flat-bar as well. The operator loads the angle onto the all-steel in-feed rollers, the system engages the material with pneumatic clamping and squaring devices and then processes the material by automatically punching both legs of the angle and shearing to length utilizing the industrial strength rack and pinion drive system. Punch Capacity Per Leg: 1.5″ up to the rated tonnage Material – 65,000 PSI Tensile. Optional: Dual 1.5″ Capacity Punches per Leg. Controller: NEXCOM PC – 15″ Touch-Screen Controller featuring multi-program memory, nesting ability, multiple pattern templates, DXF Import, TeamViewer Remote Diagnostic, WiFi, USB – See Demo Below. – Hydraulic Punch Stripper; Hydraulic Hold-down for shearing. Pneumatic hold-downs for in-feed. – Dual Punch Feature – Allows one punch, up to 1.5″ capacity, per leg of angle. – No slug loss shear cut featuring multi-sided blades. – Fully enclosed punching and shearing operations for operator safety including interlocked access doors to provide ability to change punch and die, access hydraulic and electrical components and more. – Integrated cooling system with hydraulic oil cooler. – Additional punch per leg, for a total of 4 punches. – Automatic lubrication system with programmable spray pattern.